A featherboard is a woodworking accessory used with stationary power cutting tools, including such tools as a table saw, radial-arm saw or router table. A featherboard is essentially a flat piece of wood or plastic which has a series of flexible narrow fingers cut or formed into one side. When clamped to the table of the stationary tool, the flexible fingers can be positioned to hold your workpiece tightly again the fence during rip cuts, ensuring a smooth cut as the workpiece passes against the blade. 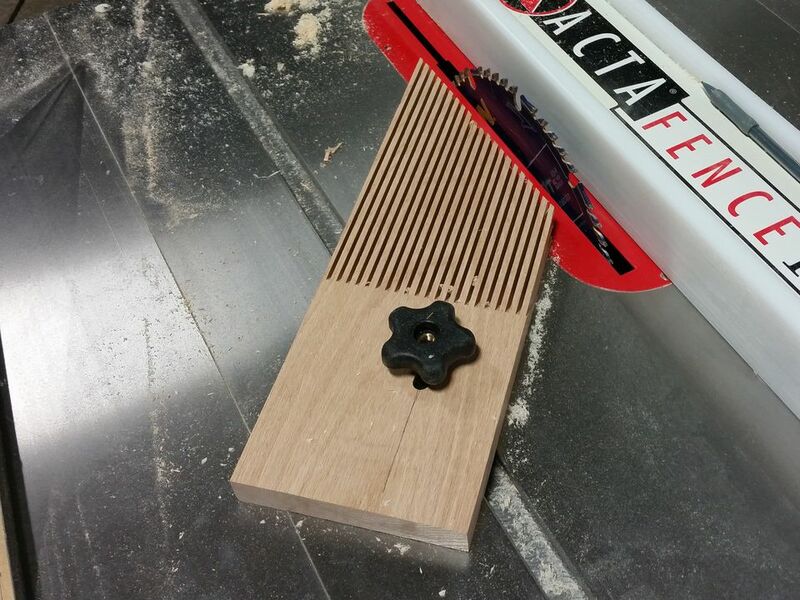 Using a featherboard is much safer than trying to hold a workpiece against the fence by hand during rip cuts. Commercial featherboards are sold by woodworking supply stores and online retailers, but many woodworkers make their own featherboards by cutting a series of kerfs into one side of a flat board cut at an angle on one end. Many woodworkers make many different featherboards of different sizes to keep on hand for various uses. There are numerous commercial types of featherboards, but whether you choose to use a homemade version or a commercial type, they all work pretty much the same. For this article, let's focus on the homemade models. You'll notice that the end of the board with the cut fingers also is also cut off at a 30° angle. This angle allows you to clamp the featherboard against the stock (which in turn is placed against the rip fence) and push the stock forward. However, if one were to try and pull the stock backwards--as sometimes happens when a piece of stock binds between the blade and the fence--it is gripped by the angled fingers, which prevent the piece from moving backward. A featherboard is, therefore, an important safety accessory, as if a workpiece being fed through a saw during rip cuts kicks back, it can seriously injure you. TIP: In some instances, a second featherboard can be clamped against the fence to hold the stock down to the table, particularly when running stock through a router table.